I have a friend named Evan who is currently teaching English in the Czech Republic. I don’t have too many opportunities to talk to him, but in one of our first conversations he was sure to mention one of his favorite parts of his travels: the beer. Specifically he enjoys the pilsners. He detailed how light they were, but somehow full of flavor. He likes them because they’re sessionable, delicious, and light. Nothing, according to him, like the beers here in America. Perhaps I shouldn’t have taken this conversation as a challenge, but I couldn’t see it any other way. I needed to make a Czech Pilsner. The Czech Pilsner, or Bohemian Pilsner, is a beer that was born in the western half of Czechoslovakia. The world’s first pilsner, the Pilsner Urquell, is still brewed there today. 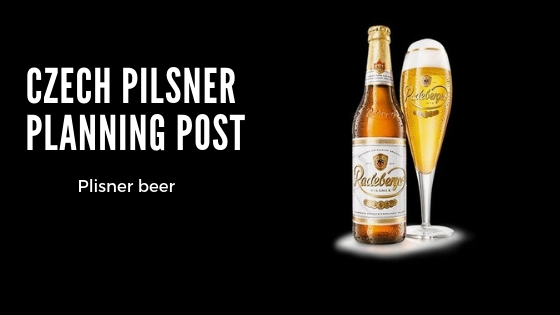 The pilsner style rapidly spread, and with the advent of modern refrigeration lager brewing became more accessible. So what makes this beer so excellent? Why is it so different than the light lagers we are used to? Where does all that flavor come from? Well, for one thing, the water. Water used in the brewing of the Czech Pilsner is incredibly soft, about 50 ppm of dissolved liquids. This water is incredibly distinctive, and brewers attribute the water as the cause of the soft hop flavor that comes through in the Pilsner Urquell. The grain bill certainly can’t be overlooked here, because it also leads to the incredibly important decoction. Czech Pilsners use 100% Pilsner malt. Traditionally, this malt is grown locally in the Czech Republic and surrounding area and malted for the beer specifically. This grain is under-modified, because the Pilsner Urquell utilizes a triple-decoction mash. Modern, well modified malt can suffer from a triple decoction. It can result in poor head retention and affect body. However, many brewers swear by the triple decoction, and the necessity for these under-modified malts. Certainly, many breweries still use this method. Saaz hops are a trademark of the style, and are also typically locally grown. I’m going to stand by Saaz as the nly hop you should be using for this specific style, partially because I like the tradition but mostly because I believe in simplicity, and all Saaz is perfect for that. Czech Lager yeasts are perfect for this, and there are a lot of options out there. Myself, /u/NickoSuave311, and /u/BrewCrewKevin are planning on brewing Bohemian Pilsners with different yeasts to see how the yeast really comes into play. More on that in the future once we are all finished. So there we have the basics of making a Czech Pilsner. So how am I going to go about this whole process? The first thing to tackle is water. My water is relatively tough. I am not one to get really into water chemistry (I probably should) but for this style it doesn’t seem like it can be ignored. I received some wonderful advice from fellow brewers to use Reverse Osmosis water for this, since it is incredibly (almost too) soft. However, a lot of sources say that using just RO or distilled water isn’t a solid plan, since the water doesn’t contain any of the nutrients necessary for the beer. I will be making a four gallon batch, 90 minute boil, which will require roughly 6 gallons of water. According to How to Brew, this is the water profile for a pilsner. I am tempted to either use a 2:1 ratio of RO water to tap water or use all RO water and actually adjust that water to the profile. I’ll be crowd sourcing an answer later on. But the water is important here, be sure to pay attention to it if you intend to brew a pilsner. I settled on using Floor-Malted Bohemian Pilsner malt, and I am very excited about it. This malt is straight from the Czech Republic and intentionally under-modified so that it can be used in a triple decoction. Now, as for that decoction, I am only going to do a single. I am not sold on the triple, and I would rather do a single decoction with confidence than a triple and be unsure. I am also adding 3% Carapils and 2% Acid Malt to the mash, in an attempt to get some head retention and lower the pH a bit. I don’t think the pH will be that different, but since I don’t plan on using lactic acid I figured I may as well give it a shot. In future versions, I may control the water chemistry more, but that will be another post. All Saaz! I’m going to FWH with Saaz and have a big Saaz 0 minute addition. Should be sufficient! Looking to hit 37.7 IBUs. Like I said, /u/NickoSuave311 and /u/BrewCrewKevin and I are going to be using a lot of different yeasts. I personally am going to be testing out WYeast 2001 Urquell Lager Yeast and 2124 Bohemian Lager yeast. I’m going to ferment at 48F until FG is stable, skip the D-rest, and lager for four-six weeks at 35F. So there you have it! The planning post. I will hopefully get around to brewing this on Saturday and I will have a full write up of everything then. Until then, if you have suggestions for the style I’d love to hear them!